/ Has Project Blue Beam Arrived? Yup, I’m going full-throttle “conspiracy” mode on this one! We’ve seen all the UN elements taking shape: Earthquakes and “resilient cities”, terror attacks, mass population displacements (migration), austerity/sustainability measures, and the ramping up of wireless technologies. We even have political figures attaining almost religious reverance! All that’s missing is the part everyone associates most with Blue Beam: NASA’s holographic sky-show. If this next item doesn’t make Blue Beam officionados sit up and take notice, I don’t know what will. Look at the location: Wallops Island: Home to superDARN (“HAARP” network). © Frank Olsen via FacebookAuroras are spectacular light shows, but a recent display in the skies over northern Norway was out of this world – sort of. During the launch, the rockets deployed chemical tracers – trimethylaluminum (TMA) and a barium-strontium mixture – that ionize in sunlight, enabling researchers to track the flow of neutral and charged particles. These tracers will help NASA measure the churning vertical winds that mix electrically charged particles and energy through the atmosphere, recording the winds’ density and temperature, NASA said. As the two AZURE rockets launched – leaving at nearly the same time from Norway’s Andøya Space Center – photographer Michael Theusner already had his camera trained on the sky, from a location about 112 miles (180 km) to the south of the launch. Theusner, writing in a description of the time-lapse on YouTube, said he “coincidentally” captured images of the rockets and of their subsequent light show. Using instruments on the rockets and on the ground, experts will track the movements of the colorful “alien” clouds in three dimensions. 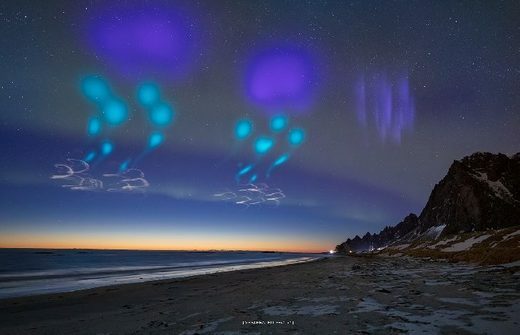 This analysis will provide important data on how particles travel through the ionosphere, so scientists can better understand the intricate ballet of energy that generates northern lights displays, NASA says.